Amazon has the assorted 10 pack of Hanes Girls Crew EZ Sort Socks on sale for just $3.98 (regularly $10.50). This offer is available for sizes 6 to 10 1/2 and sizes 10 1/2 to 4. 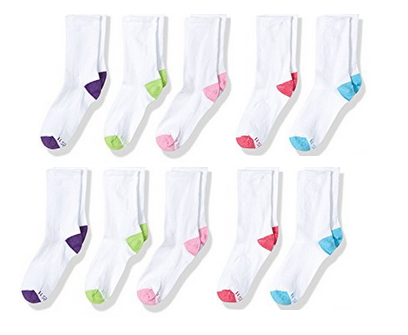 These ankle socks for girls have the EZ Sort sock matching system makes sorting socks so much easier. They also have the reinforced heel and toe for longer wear as well as a hint of spandex that gives the socks the perfect amount of stretch for a better fit.